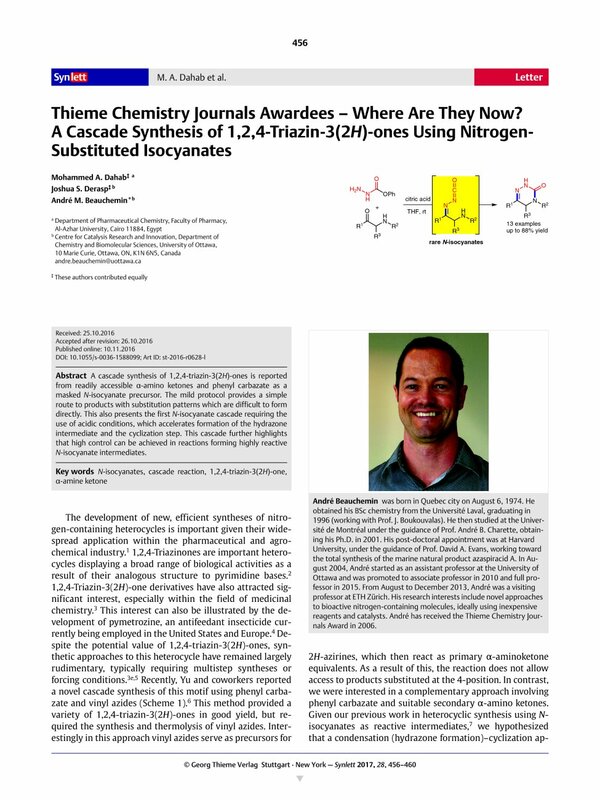 Thieme Chemistry Journals Awardees – Where Are They Now? A cascade synthesis of 1,2,4-triazin-3(2H)-ones is reported from readily accessible α-amino ketones and phenyl carbazate as a masked N-isocyanate precursor. The mild protocol provides a simple route to products with substitution patterns which are difficult to form directly. This also presents the first N-isocyanate cascade requiring the use of acidic conditions, which accelerates formation of the hydrazone intermediate and the cyclization step. This cascade further highlights that high control can be achieved in reactions forming highly reactive N-isocyanate intermediates. Supporting information for this article is available online at http://dx.doi.org/10.1055/s-0036-1588099. 12 Recrystallization resulted in a 60% yield of the desired compound while the remaining 28% was obtained through column purification. See Supporting Information for details. 13 General Procedure for the Cascade Reaction In a dry microwave vial equipped with a stir bar, the α-amino ketone (1.05 equiv) was added to phenyl carbazate (1.0 equiv) and citric acid (1.0 equiv). The vial was then sealed and purged with argon followed by the addition of purified THF (1.0 M). The resulting solution was left stirring at r.t. for 12–16 h. The reaction mixture was concentrated under reduced pressure, diluted with a sat. NaHCO3 solution (20 mL), and extracted with EtOAc (3 × 10 mL). The organic layers were combined, dried over NaSO4, filtered, and concentrated under reduced pressure. The crude products were purified by column chromatography or through recrystallization in MeOH. 14 4,6-Diphenyl-4,5-dihydro-1,2,4-triazin-3(2H)-one (3a) Synthesized according to the general procedure using α-amino ketone 1a (0.133 g, 0.630 mmol), phenyl carbazate (0.0912 g, 0.600 mmol), and citric acid (0.115 g, 0.600 mmol), then purified THF (0.6 mL, 1.0 M) was added under argon. The resulting solution was left stirring at r.t. for 12 h. The title compound was purified by column chromatography (5% EtOAc–CH2Cl2) to yield a white solid (0.186 g, 74%). TLC: Rf = 0.23 in 5% EtOAc–CH2Cl2. 1H NMR (400 MHz, CDCl3): δ = 8.09 (s, 1 H), 7.68 (ddd, J = 4.4, 2.5, 1.4 Hz, 2 H), 7.44 (t, J = 2.7 Hz, 2 H), 7.42 (dd, J = 2.7, 1.6 Hz, 4 H), 7.40 (d, J = 3.1 Hz, 1 H), 7.31–7.26 (m, 1 H), 4.74 (s, 2 H). 13C NMR (101 MHz, CDCl3): δ = 151.5, 143.3, 140.4, 133.4, 130.0, 129.2, 128.8, 126.6, 125.3, 124.5, 47.7. IR (ATR diamond): 3216, 3097, 1662, 1625, 1593, 1195, 772 cm–1. HRMS (EI): m/z calcd for C15H13N3O [M]+: 251.1053; found: 251.1056. 15 Procedure for the Primary α-Amino Ketone: 6-Phenyl-4,5-dihydro-1,2,4-triazin-3(2H)-one (3m) In a dry microwave vial equipped with a stir bar, 2-aminoacetophenone hydrochloride (0.103 g, 0.600 mmol) was added to a solution of phenyl carbazate (0.273 g, 1.80 mmol) in EtOH (1.20 mL, 0.50 M) and refluxed under argon for 24 h. The reaction mixture was concentrated under reduced pressure, and dry loaded onto silica gel. The title compound was purified by column chromatography (100% EtOAc to 5% MeOH–CH2Cl2) to yield a white solid (0.0813 g, 77%). TLC: Rf = 0.27 in 5% EtOAc–CH2Cl2. 1H NMR (400 MHz, DMSO-d 6): δ = 9.90 (d, J = 1.8 Hz, 1 H), 7.63–7.61 (m, 2 H), 7.40–7.34 (m, 3 H), 7.22 (s, 1 H), 4.60 (d, J = 1.8 Hz, 2 H). 13C NMR (101 MHz, DMSO-d 6): δ = 152.4, 141.9, 134.6, 129.7, 129.0, 125.5, 40.5.